Remy Cabella in remarkable form and finally the player Newcastle paid £12m for in 2014? Remy Cabella arrived at Newcastle United as a much sought after player by many clubs. The playmaker almost singlehandedly kept Montpellier up in 2013/14, scoring 14 goals and grabbing 5 assists. Newcastle wanted him to sign mid-season but the player insisted on staying to ensure the French club wouldn’t drop out of Ligue 1. Maybe under a better manager than Alan Pardew (and John Carver) he could have been a success but instead he and Newcastle were a disaster, as Remy Cabella managed only one Premier League goal and two assists all season, as NUFC only avoided relegation on the last day of the season. Newcastle never really recovered and their downward spiral continued until the arrival of Rafa Benitez. As for Remy Cabella, he returned to France and joined Marseille on loan with a £6m permanent deal then triggered, which gave Newcastle half their money back. However, the Premier League experience had maybe affected the midfielder long-term, as two poor seasons with Marseille saw him towards the end on the bench more often than not. Loaned out to St Etienne at the start of this season, could another fresh start get him going again? As the season has gone on, the answer seems to be a big fat yes. Ironically, this upsurge in form has coincided with another former Newcastle player joining him. After his own disaster at Arsenal, Mathieu Debuchy has been released from the remaining six months of his contract and joined St Etienne until the end of the season. Brilliant recent form from Remy Cabella has seen St Etienne unbeaten in nine and his 17th minute goal looked to have beaten champions-elect PSG on Friday, only for a 92nd minute Debuchy own goal to draw the game. Nevertheless, in 20 games this season, Cabella has six goals and five assists, having scored four goals in only his last three Ligue 1 matches. St Etienne have a real chance of Europe in eighth place, only four points off fifth. 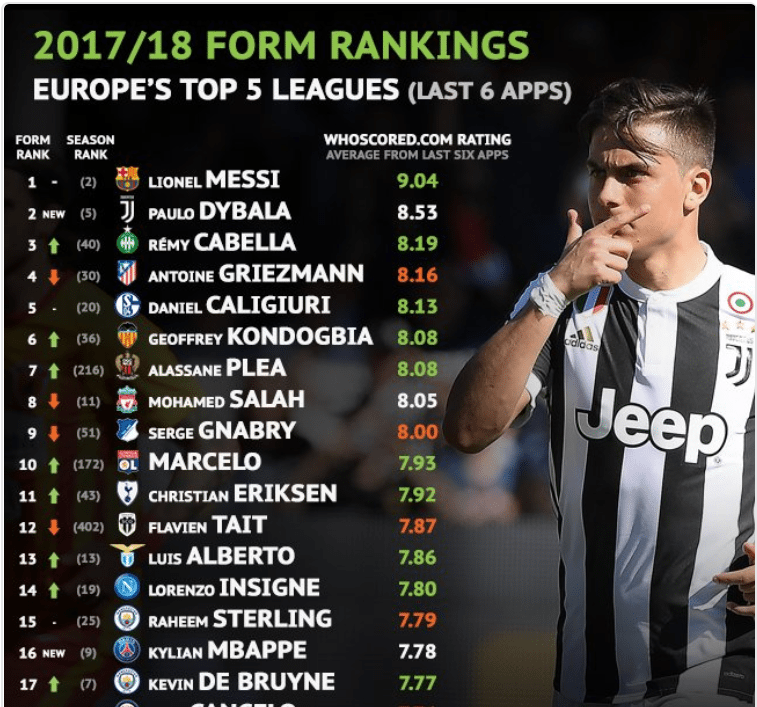 The WhoScored ratings are automated stats based rankings, on all kinds of stats during a match – not just goals and assists etc, this form guide covering the last six matches. There have even been mutterings in France of Remy Cabella even forcing his way into contention for this summer’s World Cup plans but they look a little optimistic. However, just maybe Cabella is finally once again showing why Newcastle paid for him four years ago.